Learn a new way to knit in this one-session class! Are you a "thrower" who wants to learn to be a "picker"? Or is it the other way around? Whether you knit Continental or English, knowing how to knit with the yarn in either hand is great for a lot of reasons. First, learning new things is always fun and useful. Second, you might find a new method faster or more comfortable. If your hands get sore when you knit a lot, switching your yarn to the other hand might make a difference for you. Third (or fourth, depending on how you're counting), stranded colorwork ("Fair Isle") is easier when you can hold one color in each hand as you knit. In this class, we'll start with basic techniques for either Continental or English knitting, whichever is new to you. 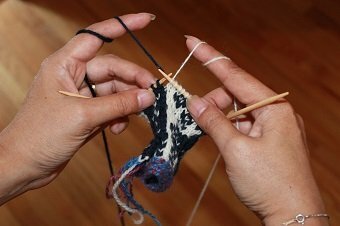 If time allows, your instructor, will show you a few techniques from other knitting traditions, such as Norwegian purl and Portuguese knitting. Bring yarn and needles to make a swatch or simple project so you can practice your new knitting style.